Monday was Canadian Thanksgiving. For the occasion my brother took a 14 hour train ride (it was supposed to be 7 hours) from Germany to Switzerland just to eat turkey with his sister...awe! Celebrating Thanksgiving in Switzerland is no small feat. Not that they don't sell turkeys, they just don't normally sell them whole. They have to be ordered, especially for Canadian Thanksgiving, and even then there's a big question mark as to whether it will fit in the oven. One year we invited eleven people over and then realized our oven wasn't big enough. We literally cooked the turkey seven blocks away at a friend's place threw it into the back seat of the car and drove it to our house. Parking was nightmare. Also living in one of the most expensive countries in the world whole turkeys are not for the underprivileged. A 5kg turkey costs approx. $80. There are cheaper alternatives in France but that would require stashing poultry in your car and smuggling it across the border. A safer bet would be to stuff it into a backpack and bike but you also have to consider that after 45 minutes of extreme pedalling, 5 kg extra weight can become a back-breaking, hot, sweaty mess. Not that I would know....I'm just say'n. This year there were eight of us around the diner table. We manage to include all the traditional fixings like cranberry sauce. Thanksgiving is my favourite holiday. So far away from home, I'm particularly grateful to be able to celebrate it with friends and family included. No ravioli for me that night! Wow. I had no idea turkey was so expensive. I'm paying for my family's Thanksgiving this year. 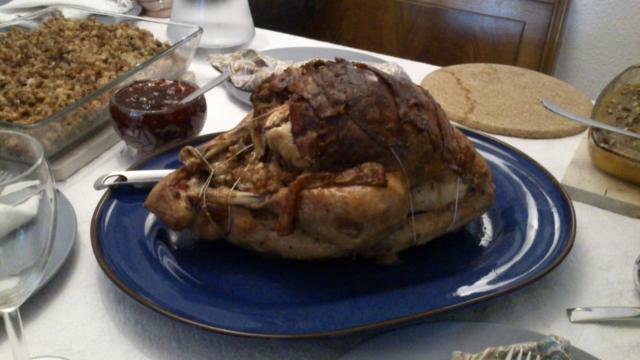 My mom hates turkey so it's ham every year. I'm getting kind of sick of always having to eat ham. We had a pork stuffing to go with the turkey. Not that I'm suggesting you stuff a ham in a turkey. Merging to animals sounds kind of wrong. Then again I might be on to something. Turham, Hamkey.....anyone for a nice hot cup of Mockolate?